You go by the name of "Don". You went for a walk in the woods to enjoy a nice day. You day-dream of exciting adventures in far-off lands, and not paying attention as you should, you soon end up deep in Evergreen Forest. You remember old Folk-Tales about Evergreen Forest... Some stories tell of strange creatures, magical things, as well as many dangers and hidden treasures. But those are just stories made up to entertain... or are they? Well, enough day-dreaming.. Time to find your way out of here. Now which way to go? A few highlights of my game to note: *Currently the game has over 30 rooms to explore. *The game display is designed for 640x400 mode in 16-bit color. *GUI to select Game Speed and Music Controls settings. *Hopefully easy-to-use interface (I also took advantage of the wheel-mouse functions too, but don't worry, players with a non-wheeled mouse still have all the same options). *1 main player character with 7+ appearing (and mostly interactive) NPCs. *A story that starts out simply enough, but turns into something deeper as the game is played through. *Various puzzles to solve/overcome, some of which can be solved in different ways. *I tried to avoid "pixel hunting" or "walking dead-man" scenarios. *A couple of "Easter egg" type of surprises. *Some "Guest Appearances" by some famous well known Adventurers. *Possible "Player Can Die" scenarios if bad/incorrect choices are made. *Use of a couple of fantastic Plug-Ins to great effect (Rain and Flashlight - well in my game it's a Lantern though). * A detailed ReadMe.txt file will be included. * Good vs. Evil, Magic, strange creatures, cool music and sound effects, drama, humor, action, a scantily-clad seductive temptress, Earthquakes, Lightning, Explosions, Destruction, ... overall an action packed thrill ride What more could ya want? * Complete the game with a Perfect Score of 65 points, and unlock a "Bonus Adventure" in which you get to play as a certain famous "Archeologist". Okay, Indy, hand me the whip please... *Crack! 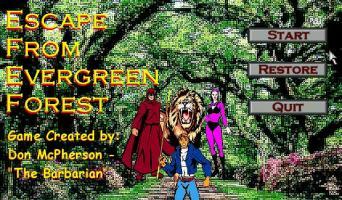 * Now go and play Escape From Evergreen Forest and get a perfect score. *Note: It was brought to my attention of a problem in the game that I missed that can "crash/ lock-up" the game. If you open the Inventory window (your Back-Pack), and if you try to interact with the main playing area again before clicking the "OK" button of the Inventory window to close it first, the game may "crash / lock-up" on you. I'm sorry for this error, so for now, please keep in mind while playing to always click the "OK" button of the Inventory window to close it before trying to interact with the main playing area again. Thanks for understanding. Tech Note: This game should run fine on most versions of Windows and on just about any modern computer system. If you have an older/slower computer, check out the "ReadMe.txt" file that comes included with the game's files for tips on how to improve the game's performance. Fun little game. The mix of graphics can be a little repellent at first, but the atmosphere is nice and the puzzles are good so it worths persevering. The game is fairly easy, but I admit that I didn't make it to the "real" ending. Escape from Evergreen Forest is already picking up some acclaim despite having only been released about a few weeks ago. A debut AGs effort by Don McPherson, EFEF is a lighthearted delight. The main thing that attracted me to the game is the beautiful forest backgrounds which really create an atmosphere of the great outdoors. Although I did not detect much hint of peril (the evil wizard is just funny), the beauty of the Evergreen Forest comes across. The characters stick out a little against the refreshing scenery, and the crude drawings inside the treehouse seem totally out of place, but as a setting the forest is really excellent and uplifting. EFEF has a somewhat old fashioned feel to it, which adds a nostalgic charm to the game. There are occasional puzzles that make little sense in that the object used to solve them is simply lying around somewhere that bears no relation to the object itself (SPOILER: Who on earth has left a pair of shears in a cave full of crystals), and the final showdown proves anticlimactic when the game pretty much tells you what to do instead of letting you work it out yourself, but overall the puzzles are not too easy or difficult. I really enjoyed exploring the evergreen forest and taking in the beauty of it babbling brooks, murky swamps and secret caves. Despite a few minor problems, EFEF is utterly charming and made me want to turn off my computer and go for a walk through a real forest. I wouldn't have dreamt of doing this until I had finished the game though. I don't want to run into any evil wizards, no matter how hilarious they are! This game is AWESOME! After getting help with one part for points I was able to finish with a perfect score (the 7th time playing). Thanx Don, for your help and for a great game. Wonderful game and I played it many times already. I even got a perfect score and played the extra bonus Adveuture as Indy. Wow, I hope to see more of your games. Thanks! That was an incredible game.